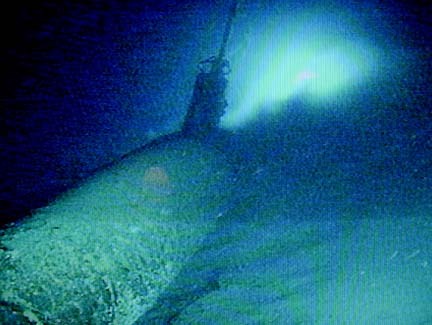 The Japanese midget sub looms, resting almost upright, in the darkness in this image captured off a monitor showing film from the dive. University of Hawaii submarine pilot Terry Kerby spotted a Pearl Harbor historian standing pierside as the research ship Ka'imikai-o-kanaloa was docking, and he rushed over and stuck out his hand as the ship was still moving. "We found it, man, we did it!" he beamed, hand-shaking for all he was worth. Researchers aboard two University of Hawaii deep-diving submersibles discovered a Japanese midget submarine about three to four miles off Pearl Harbor yesterday afternoon. Discovering the final resting place of the first ship sunk in the Pacific war had been something of a personal mission for Kerby and the rest of the Hawaii Undersea Research Lab (HURL) for more than a decade. An Imperial Navy "midget" submarine, sunk by the destroyer USS Ward an hour before the Japanese air attack on Dec. 7, 1941, had become a piece of Pearl Harbor lore. It was shot at and sunk outside the harbor entrance, in a vast, night-dark sea floor littered with military debris tossed overboard by the Navy. Allowed only a few test dives in the area every year, the HURL team had methodically filled in the pieces of an underwater map of the site a little at a time. "Sooner or later, it was going to turn up," said Kerby. Previous efforts to locate the submarine had been unsuccessful, including a televised hunt by explorer Robert Ballard last year for National Geographic. In the last hours of a three-day dive, the HURL team was using submarines Pisces IV and Pisces V in tandem. 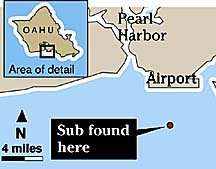 Al Kaluaitis, an administrator with National Oceanic and Atmospheric Administration, was on the dive, and when the submarine was located, he called Washington. "Just three weeks ago, I was diving on the USS Monitor, and now the most famous Japanese midget submarine has been located," said Kaluaitis. "On an order of magnitude, this is more thrilling, like finding the Titanic. This has been a very exciting summer for me!" "The submarine is located in a very, very complex debris field, and in very good condition," said acting HURL Director John Wiltshire. "They knew it was the Ward's midget submarine when they discovered that the torpedoes were still in the tubes and the hole in the conning tower. It's the one we've been looking for, for a long, long time." 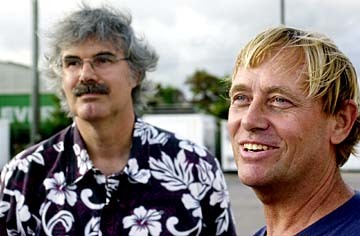 Terry Kerby, right, operations director and Pisces V chief pilot, and John Wiltshire, associate director of the Hawaii Undersea Research Lab, talked to the media yesterday on the dock of Pier 45. Kerby and Wiltshire, examining videotape, remarked on the "excellent condition" of the craft. "There's no apparent damage except for the shell hole in the sail," said Kerby. "No sprung seams, no twisted gear. The net-cutter guards over the torpedo tubes aren't even bent. It must have settled on the tail and flopped down instead of diving directly into the bottom. "The stiff currents on the bottom also scoured the sand around it, keeping it clear. There are some pieces of fishing line and netting hooked on it, which is interesting -- who's fishing way out here?" Kerby found the discovery exciting but sobering. "This is the first victim of the Pacific war, and no one has seen it since the moment it slipped under the waves on Dec. 7. You look at it and see the hole in the side exactly the way the destroyer crew described it, and you also realize this is a time capsule of the last moments of the crew's lives." Remains of the two-man crew are likely on board. The submarine is not marked, so it is not known which of eight missing submarine sailors it holds. One submarine was captured the morning after the attack, and skipper Kazuo Sakamaki was captured, while crewman Kiyoshi Inagaki was killed. The crew of the other four midget submarines vanished, or were buried without being identified. Since the submarine was sunk in battle, it remains property of Japan, even though it lies in American waters. A spokeswoman for the Japanese consulate in Honolulu, when asked if Japan would recover the crew, said, "We cannot comment on such amazing news without direction from Tokyo." Although the exact location is being kept quiet by the HURL team, Kerby and Wiltshire are confident it can be found again. They are not due to dive again in the area until next summer. Also discovered during test dives this week was a scuttled gunboat about 180 feet long. "Pretty old, looks like it was deliberately sunk," said Kerby. "Looks like it might have been some sort of Coast Guard cutter. They probably pulled the plug on her after the war." For America the first shots of World War II were fired in a patch of deep, blue ocean just southeast of the entrance to Pearl Harbor. Largely overlooked in the hurricane of destruction on Dec. 7, 1941, is the underwater element of the Japanese attack -- an effort to ring Oahu with a fleet of submarines and pick off American warships. Included in this "advance force" were five test-model submarines, 79 feet long and capable of 20-knot bursts of speed underwater. The "midget" submarines each carried two crew members and two torpedoes, and were piggybacked on larger submarines and cut loose on the night of Dec. 6. At dawn on Dec. 7, a midget submarine was observed attempting to follow the cargo ship Antares past the anti-torpedo nets that closed off the harbor entrance. The destroyer USS Ward, assigned that day to patrol the harbor entrance, immediately bore down on the tiny periscope. 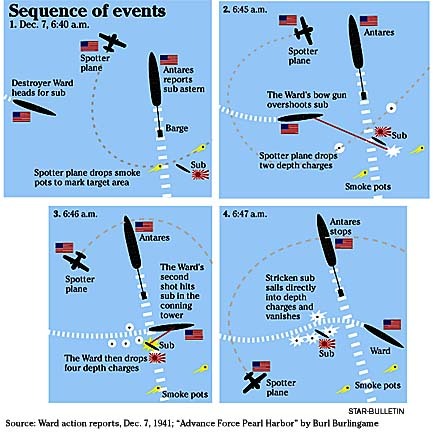 A Navy patrol plane dropped smoke pots to mark the location. The forward gun of the Ward fired once at the submarine and missed, and, as the destroyer swept by the target, the gun on the starboard side of the ship fired another round, knocking a hole in the submarine's conning tower. The Ward rolled four depth charges off its stern, and the submarine drifted into them. The explosions lifted the craft out of the water, and it disappeared in the water. The Ward's skipper, Lt. William Outerbridge, radioed ashore that his crew had fired upon and sunk a hostile submarine in the exclusion zone. While his superiors were seeking confirmation of this startling news, airplanes came screaming down on Pearl Harbor. Most of the Ward's crew were naval reservists from St. Paul, Minn., and the gun that sank the midget submarine off Pearl Harbor is today a "First Shot" memorial in that city. 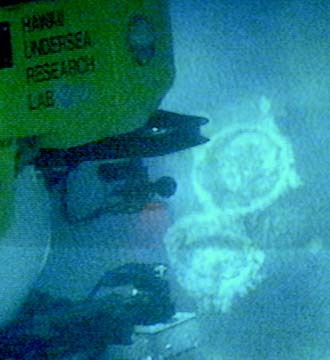 The Pisces V, inspected a torpedo tube on a Japanese midget sub. There are still torpedoes in the tube. Sinking rapidly with a hole punched through the upper pressure hull and a dead captain at the controls, the first casualty of the Pacific War glided underwater for several miles east before slamming into the dark, sandy bottom. "Even though it was depth-charged four times, there was no evidence of 'washboarding' (rippling) on the hull or other damage," said Terry Kerby, skipper of the University of Hawaii research sub Pisces V. "There's just this clean hole right through the base of the conning tower and out the other side -- terrific shooting by the (destroyer USS) Ward's crew. "The stern dive planes were set upright, which would have made the craft 'porpoise' through the water to an upright landing, and the rudder was set straight," said Kerby. The area where it was found is also some distance from where National Geographic explorer Robert Ballard searched. Recently, the Hawaii Undersea Research Lab team considered the theories of submarine historian Ken Hackler, who insisted that the midget sub was in shallow water right at the harbor entrance. "Hackler was way off," said Kerby. "But nobody knew for sure until it turned up. We've continued searching at the thousand-foot level, and it turned out we were right all along. That's either science or applied guesswork, and right now I'll say it's science."